Along with a group of friends I’ve become involved in the play-testing of Chain of Command a new set of rules from TooFatLardies that are due to be published later in the year. Last Saturday we went through to the Wappinshaw show in Glasgow to run public participation games using the rules. You can find a brief report of this on the South East Scotland Wargames Club website. In preparation for the game I made the play-aids pictured below. In the middle there’s a board with tracks used for recording a forces status during a game. 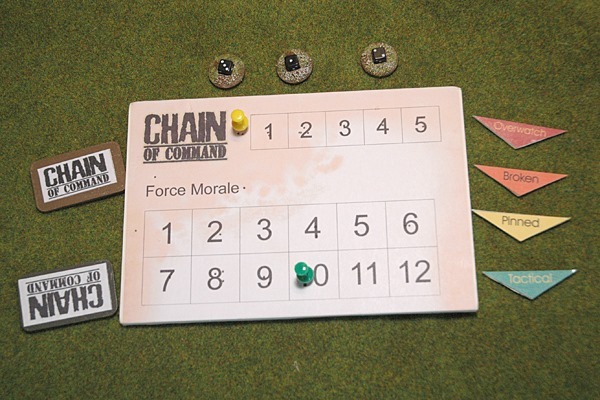 As things start to go wrong in a game your force loses points from its Force Morale, surrendering or running away when it reaches zero, while the top track is used to record progress to obtaining a Chain of Command counter (pictured on the left) We use these counters instead of the Chain of Command dice that are specified in the rules and you collect one point for every five you roll during the Command Phase of the game, gaining a CoC chit when you reach six points. CoC chits can be used to do various things in the game, ambush the enemy with a hidden fire team or interrupt their movement to fire at them with a team that’s already on the table to give two examples. Above the board are some of the markers we use to record shock points, which represent a unit losing coherence and effectiveness, while to the right are various markers used in the game. I’ve used triangles for these so that I can indicate the arc of fire covered by troops on overwatch. These play-aids are all prototypes at the moment, but I intend make up final versions and make them available for download here before the game goes on sale.